This lecture will build on the ideas you saw in lecture 5 and focus on examples that explore some of the key concepts from that lecture. The examples in this lecture are a little more complex than previous examples – mainly in the sense that the function nodes are more complex – but are still kept as clean and simple as possible. This lecture will build on the ideas you saw in lecture 5 and focus on examples that explore some of the key concepts from that lecture. These include the ideas of context, messages and sub-flows. The examples in this lecture are a little more complex than previous examples – mainly in the sense that the function nodes are more complex – but are still kept as clean and simple as possible. 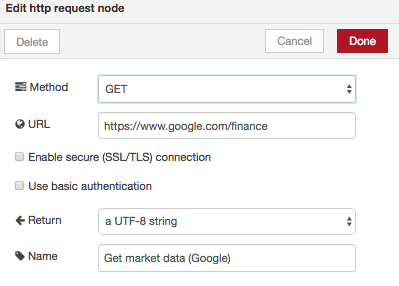 Let’s write a flow that scrapes the latest stock market indices from google at http://google.com/finance and format it using a function node. If you inspect the page shown in Figure 6.1 using the Chrome browser’s ‘Inspect Element’, you’ll find that the three indices have the same td.bld span tag. This tag can be used to retrieve all three indices with the html node. 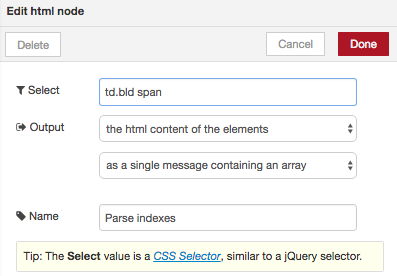 You’ll set up an inject node to trigger an http request to get the page, then the html node to get the elements with the td.bld span tag. Figure 6.1 Stock market index page from Google. Figure 6.2 Configuration of http and html nodes to retrieve stock indices from Yahoo. Then wire them up as shown in Figure 6.3, with a debug node to show the output. Figure 6.3 Flow to retrieve the market indexes. Figure 6.4 Stock indices as array of strings. Now wire this into your flow as shown in Figure 6.5. Figure 6.5 Complete market index flow. Once you deploy and test, your debug console should output something similar to Figure 6.6. The data now looks good and you can use this format for downstream nodes in your flow. Figure 6.6 Debug output from new flow.